Coffeeneuring season has arrived! Hard to believe that the Coffeeneuring Challenge is now in its fourth year, but I looked at my calendar and it really is true. From 12 participants that first year to over 125 last year, coffeeneuring continues to grow. I hope you will consider giving it a go this year. Coffeeneuring, I thought. It’s perfect! I launched the Coffeeneuring Challenge that year. 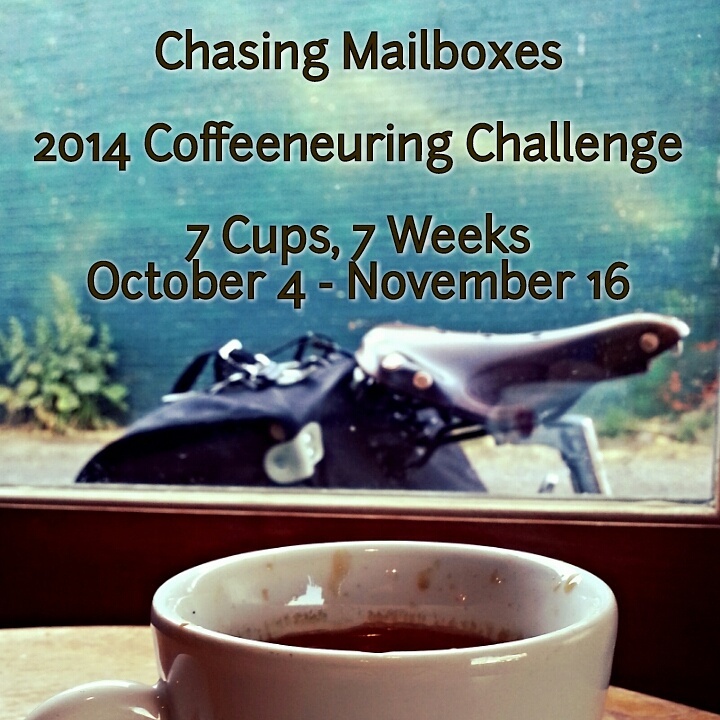 The Chasing Mailboxes Coffeeneuring Challenge is a relaxed weekend cycling endeavor for cyclists everywhere. If you like riding a bike and enjoy drinking coffee or tea (or even hot chocolate), consider taking on this challenge. In a nod to the French as well as randonneuring, the Coffeeneuring Challenge has its share of rules. Don’t let them intimidate you, though. As those who have successfully completed the challenge in previous years will attest, they are all manageable. Rules are barely updated from last year. The biggest change to the 2014 challenge is that, due to increased interest and participation in coffeeneuring, I will be offering prizes (an embroidered patch, suitable for application on all kinds of things) at the bargain price (i.e., my cost) of $4 per person (see Rule 15). Ride your bike to 7 different local coffee shops from Saturday October 4 through Sunday, November 16. Any place that sells coffee qualifies as a coffee shop. You may also coffeeneur to a Coffee Shop Without Walls. A Coffee Shop Without Walls is a place where you ride your bike to proceed to make and/or drink coffee. The Coffee Shop Without Walls is geared toward the bike overnight or bike camping participant. It also captures the farmers’ markets. Only Saturday and Sunday rides qualify. Weekday rides are ineligible, unless one of the following applies to you: a. You have a job that does not have a Monday through Friday tour of duty. In that case, your days off are considered your weekend; or b. You are retired, in which case you may choose any two days to complete your coffeeneuring outings. No other exceptions, unless you can make a convincing case for one. Jot down a summary of your experience that includes: 1. where you went (address and website, if possible), 2. the date you went there, 3. what you drank 4. a detail or two about your coffeeneuring ride, including your assessment of the “bike friendliness” of the locale; and 5. total mileage. Also, if you find any “must visit” coffee shops or tea places please share that as well. Take a photo during your outing, and submit it as verification. Hot chocolate qualifies, as do tea beverages. Apple cider is also a coffeeneuring-approved beverage. Note: Drinks do not have to be hot! They just have to be coffeeneuring-ish type drinks. Your ride must be at least two miles total, but there is no maximum so yes, you could ride 100 miles (or more!) for a cup of coffee. You have to go to 7 different locales, although you may ride to multiple locations of a chain, if necessary. For the Coffee Shop Without Walls, you must prepare and/or drink your coffee in different places. That means seven different campsites/locales. Deadline for submitting Coffeeneuring Challenge entries is whenever the clock strikes midnight in your area on November 24, 2014. Send submissions to me at gersemalina “at” gmail.com. They may be in the form of links to blog writeups, screenshots of or links to your coffeeneuring Tweets, on-line photo galleries with accompanying narrative, Word documents with attached or embedded photos, or e-mail writeups and submissions with photos attached. UPDATE! If you complete the challenge as a group, you may provide one submission for all of you, provided you completed all rides together. Provide all qualifying rides at the same time. That is, send me all 7 together, NOT ride 1, ride 2, etc. Prizes! You are eligible for a small prize for finishing the challenge. Because of the increased interest in coffeeneuring, the premium will cost $4, which covers my costs. To purchase your prize, you may PayPal me at the gmail address above, or send your money by snail mail like grandma used to do. Email me for my address. If you are an international entry, email me and we’ll figure something out. Tara Rule: During Columbus Day weekend (October 11-13), you have three days to accomplish two qualifying coffeeneuring rides. (This is the Tara Rule.) Update! Rresidents of Canada may use Canadian Thanksgiving in place of Columbus Day. Vacation Rule: This rule has been updated! If you are on vacation during the coffeeneuring challenge, you may coffeeneur any two days of the week for the weeks you are on vacation. Veterans Day Rule: You may coffeeneur on November 11, Veteran’s Day, INSTEAD of the previous Saturday or Sunday (November 8 and 9). Veterans are permitted to coffeeneur on November 11 in ADDITION to Nov. 8 and 9, in recognition of their service. Buying Beans Rule: You may use ONE of your seven coffeeneuring trips to purchase beans (or tea) from your local roaster or tea emporium for future consumption. 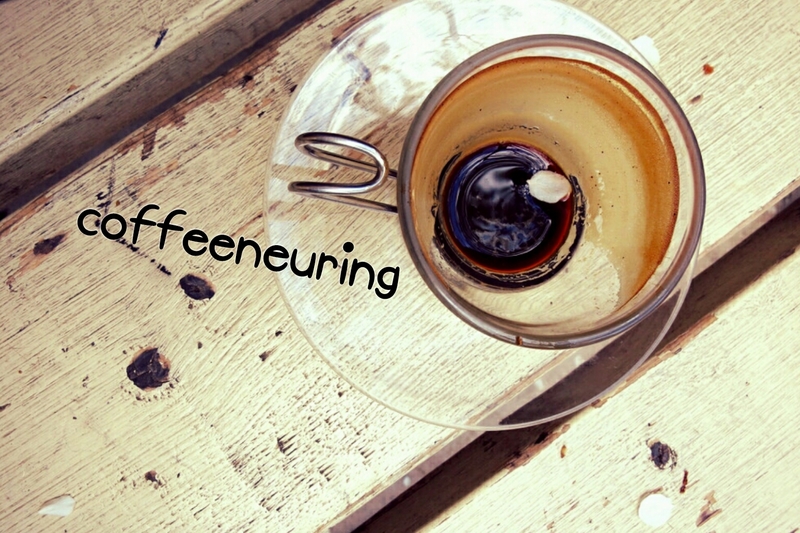 Facebook: There’s even a Coffeeneurs Facebook group where you can post and share your coffeeneuring. I think that covers it. 19 rules for the 7-ride Coffeeneuring Challenge. I thought I might add more this year, but 19 is quite enough. It all starts October 4. Seven shops in seven weekends. I know you can do it! Is chocolate milk and/or Root Beer allowed? I don’t like coffee. Yes, an alternative beverage is allowed. Yes, if it is an informal ride it counts. No card-carrying or entry fees rides, basically. To begin: I so appreciate you doing all the work on Coffeeneuring. Having spoken with a few folks may I respecfully submit a question, possibly a suggestion, for a redraft of Rule3. And the reason isn’t that there’s anything wrong with Rule3, as much as: the world has changed and perhaps Rule3 could adapt along with it – and I think we could grow the population with a better Rule3. The immediate problem is: Lyft and Uber, but the larger meta-category is the changing social contract and the anachronistic notion of the “weekend”. Folks are living and working 7 days a week now; a primary job, that second gig, and ride-sharing during peak hours. Doing a little tour-guiding on the side and in general trying to survive in the “New Economy”. Rule3: One coffeeneur ride per 7-day period, except as provided elsewhere (see Tara’s Rule, Vet’s Rule, Vacay Rule). Hi Vannevar, it’s actually a good point to consider. For this year, I will leave the rule as it stands, and perhaps implement (can you tell I’ve been working with regs and policy today??) your suggested rule change next year. For what it’s worth, I’d argue against the “24/7” workweek perspective. It may be true that electronics enable this to be a way of living and working, but I’d suggest that being in work mode all the time is still, on some level, a choice, not an absolute reality. Even if the lines are blurred, I think we do ourselves a favor by re-affirming the reality or notion, whichever it may be, of a weekend. Lets not give in and just say all bets are off on the separation of work and time off. Wouldn’t that be covered under 3.a? Also, as written, you can have 2 rides in one weekend without mucking up the next weekend’s schedule. If your work schedule changes from week to week then your amendment would potential make it harder to get a ride in on your day off. Hi SaraK – yes, I guess it could be. I’m suggested that we examine our roots in “weekend priviledge” and ask, Why does the weekend matter? Why are we “weekend-normative”? What I’m suggesting is: one ride a week, any day you want. WorkDay, OffDay, Half-Work-Day, whatevs. Cheers, V.
I like the idea of separating coffeeneuring from getting coffee on the way to work but then I get to work a five day schedule. I think what is intended (or what these challenges do for me), is getting us out of the house on our bikes when we otherwise might not. And you can do that without confining those who are working around the week. Perhaps a rule might read: “if you are working a second job then coffee on the way to work is encouraged.” Deciding which job is second is up to the individual coffeeneur. Could a business trip which consumes an entire weekend with no hope of biking fall under the vacation rule? The worst kind of vacation :). Yes, I would allow that. Is there a participant sign-up prior to the start of the challenge? Thanks MG! This sounds yummy! Super excited to complete my first Coffeeneuring Challenge this year. What about you? Planning to adventure on two wheels in pursuit of delicious caffeinated beverages? Love it! Only problem I foresee is that I reckon I have 4 regular coffee shops, so on the weeks when I head out to find the missing 3 (to make up the 7) the others might worry, wonder where I’ve gone, and (more to the point) suffer a serious hit to their takings! MG, you are awesome! I know this is work on your part and we appreciate it. I won’t be riding this year (injury) but I know others on the FB Random Randonneuring page will be having loads of fun and I’ll be living vicariously via their posts AND your blog. I love it! I’m already plotting a jaunt over to Zoka for this weekend’s ride. Perfect! An excuse to test out my new camp stove! I really like the idea of this and want to thank you for doing this challenge. I would like to participate. I live in a rural community with some very small towns — high cottage season ramps the area population to 45,000. We also have a real lack of good coffee spots — I run the only local (very small) roaster (with small attached café). Would my own shop qualify? I realize it is “work”, and I don’t want to make this a form of blatant self-promotion, but I was planning to do it on one of my days off! Sunday and Monday. Except for one or two other spots all the others will have to be “Cafes Without Walls”. Yes, of course, there is no restriction on going to your own shop. Welcome to the challenge! Am kommenden Samstag (04.10.) fängt die #Coffeneuring Challenge an. Das ist eine gute Gelegenheit, radeln und Kaffeetrinken zu kombinieren. Hello! I’m using the challenge to motivate some new friends to try biking… can we submit as a group? Excellent! Yes if you do all the rides together you may submit as a group. This was already decided on the Twitterverse. Kidical Mass can count toward Coffeeneuring. Here comes my ignorance — when you say “blog”, do you mean one’s own blog online somewhere, or blog here somewhere? If here, how does that work? Hi Nancy. I mean one’s own blog online somewhere. Thanks. I’m in and will have my trips on my blog, but I don’t do social media so I assume you will get me at the end when I email you my results on my blog. Ok, I love this idea. I’m in! As a retired guy I’ll officially call today (Oct 7th) my weekend to start. As soon as the fog lifts off the Snohomish River it will be “tea time” on the bridge over the marsh. (Outdoor coffee shop). I am deducing that Saturday is the first day of the week and Friday the last day of the week for this challenge/event. That would give me tomorrow to ride for my teaneurring #3. Rule 8: What if the organized ride is to a coffee shop for the purpose of introducing others to coffeeneuring? I’m considering leading a club ride to my next coffeeneuring destination. I think some in my club are quietly participating in your challenge after I shared this page on our FB page. My ride may bring more. Some will ride for the mileage instead of the coffee. Will it count for those seeking coffeeneuring credit? Yes, it would count for coffeeneuring. Organized = event ride (such as Seagull Century or brevet), paid an entry fee. I consider club rides informal. Maybe I need to consider changing the term to informal for next year, rather than organized. In any event, you are good! Nit-picky, but for next year, just combine rule 17 into rule 3; and make 16 and 18 3a and 3b. or 4 and 5 moving the rest down. They are all about when. I was just added to the group and have lost valuable time! Starting this weekend, it is only possible to do 6 trips before the deadline. I wonder if being a relative of a military vet, donating to the Disabled American Vets charity would open up November 11th? Please advise…. Welcome to coffeeneuring! Unfortunately, I can’t really alter the rules at this point, but feel free to join in now to see how many trips you complete and to mingle with the Facebook group. Pingback: The 2014 Coffeeneuring Challenge | portajohn. I’ve found the weekend (whatever that is to you) requirement to be a somewhat counterintuitive challenge. I ride to work almost year round, so I’m on my bike often, but other then decided upon rides and randonneuring events, I’m seeing that riding on the weekend is a little outside my norm. That said, I’m appreciating the requirement that rides be done on one’s weekend. This has caused me to ride at times that wouldn’t occur to me otherwise and I’m glad about it. My pleasure! It’s been so much fun to do it these years. I appreciate everyone’s comments about the weekend vs. other days. Good food for thought as I think about next year.